Thanks for the comments on last weeks Made in America post.﻿ I'm glad there are others who feel the same as I do about supporting American companies when we can! If you missed last week's post, my sister and I are sharing our favorite made in America products every Thursday until Christmas. 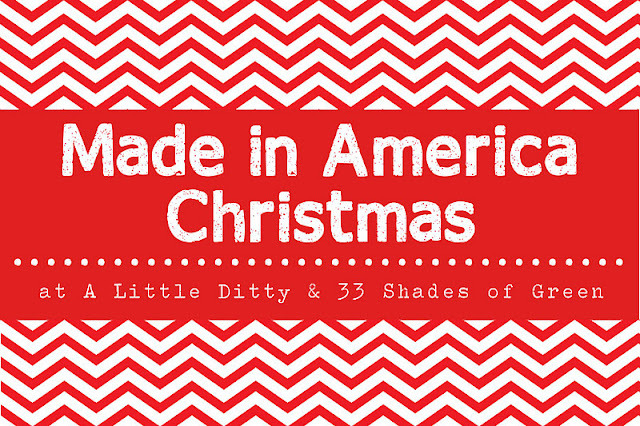 Visit A Little Ditty to see my sister's made in America finds. Also, I received a comment last week from a reader wondering if I knew of any American made Christmas garland. I searched all over the web and can not find anything. Do you guys know of any? My only suggestion would be using fresh greens. I wish I would have been able to find one for you! For today's edition, I have a few fun picks for kids. Wouldn't you rather buy toys made here in the USA than from China? I know I would. First up, Uncle Goose. Uncle Goose makes the most beautiful, wood block sets. There are many, many more sets on the Uncle Goose website. 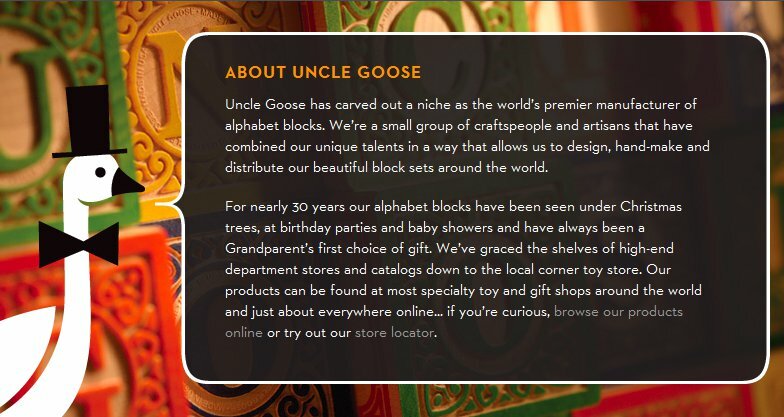 For the Michiganders out there - Uncle Goose blocks are made in Grand Rapids! You will find a store locater on their website or you can buy directly from Uncle Goose online. Anthropologie loves Uncle Goose blocks - they sell them online. I am really happy I came across Green Toys. Their toys are adorable and I love them even more knowing they are made in the USA! "We believe the world would be a much better place if everyone said “please” and “thank you", cell phones didn’t ring during movies, and all toys were fun, safe, and made from environmentally friendly materials. Since it’s probably no use holding our breath for those first two, we’re concentrating on the toys. Green Toys Inc. makes an awesome line of classic children’s toys constructed from recycled plastic and other environmentally friendly materials. This helps reduce fossil fuel use and reduce greenhouse gas emissions, improving the overall health and happiness of the planet." 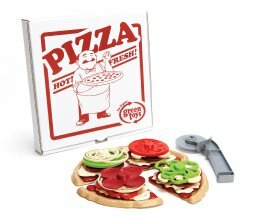 How cute is this pizza set? 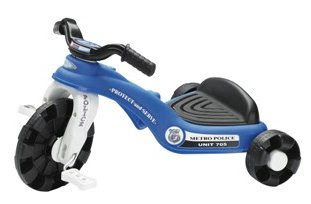 It is nominated for the 2012 Toy of the Year Award. I really like the packaging Green Toys uses and the store behind it. 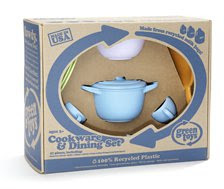 "Green Toys environmental mission even extends to our packaging. We strive to minimize packaging, and all of our boxes use as little material as possible. All Green Toys products are packaged in recycled corrugated boxes with no plastics, cellophane or twist-ties, and are 100% recyclable. So, not only are they earth-friendly and ready for your recycling bin, they are really easy to open for those little fingers just itching to get at the toys!!" You can purchase Green Toys directly from their website by clicking here or see their website for a list of retailers. I was really happy to learn that about 60% of Little Tykes toys are still made in the US. Yay Little Tykes! They have a section on their website just for their toys made in the USA. Click here to see the list. 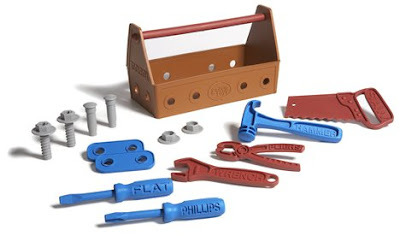 One of the toys made in the USA is one I'm sure we are all familiar with. 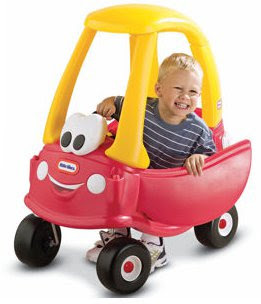 The Cozy Coupe! "Camden Rose is a collective voice of designers, artists, teachers, musicians, craftspeople and parents who chose to bring about a better future for our children. 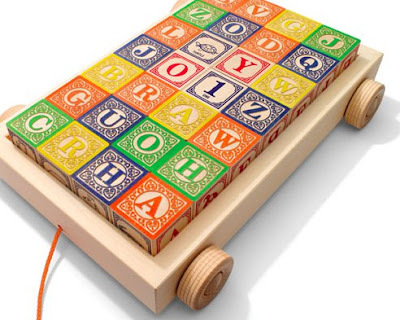 We design and manufacture simple, elegant and unique wooden and textile toys. Green natural materials and USA and Fair Trade manufacturing highlight our “leave no footprint” philosophy"
A small portion of their products are made in Peru through Fair Trade and those items are clearly stated on the website. 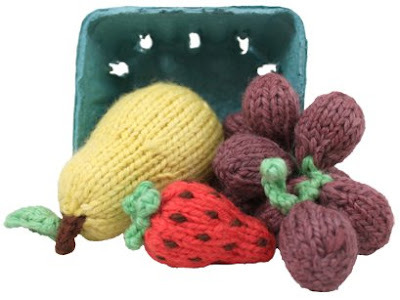 How adorable is this knit play food? 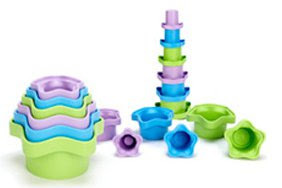 Camden Rose has many other products, including wooden baby toys, play kitchens, and dolls. You can find where to buy their products here. Lastly, here are a few products from American Plastic Toys. 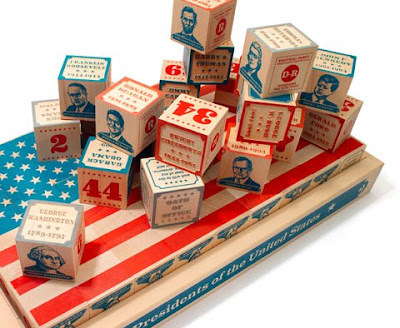 They have proudly manufactured plastic toys in the USA since 1962! 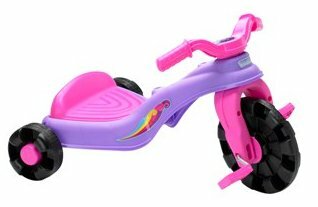 "American Plastic Toys has proudly manufactured safe toys in United States since 1962. We currently operate a total of three facilities in Michigan and Mississippi. 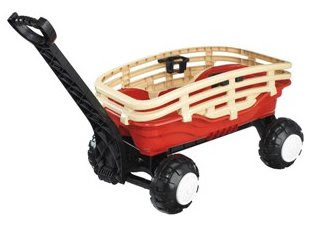 Our product line includes over 125 different items ranging from a simple sand pail to a play kitchen set. We assemble 100% of the toys in our product line in the United States. Most of the components in our products are molded in our plants or purchased from US companies. Less than four percent of our toy value content is imported from the Far East. The majority of this small percentage consists of sound components and fasteners. Toys with imported components only represent 25% of our entire product line. None of these components are painted." Those are my picks this week. Do you have anything you would add to the list? I would love to hear what your favorite made in America products are. On another note, I want to say thanks to Beverly of A Serene Life For Me. This week Beverly freatured me on her blog. Thank you Beverly for your kind words about me & 33 Shades of Green! Beverly has exquisite taste and her blog is full of beautiful things. If you have a moment, head over and visit her! Great post, Alissa! I am so happy to learn about the Uncle Goose blocks since I'm about to be a grandma for the first time in June and I may or may not be stockpiling things already.... And to think they are made here in Michigan and I've never known about them! It can be really tricky to put together a list of USA-made products because hairs are split. Some products are assembled in the US with raw materials made elsewhere and vice versa. What a great list! 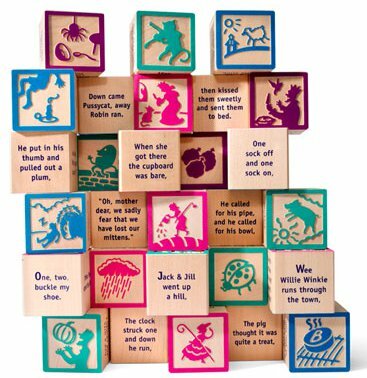 I love those Uncle Goose blocks and had no idea Little Tykes still makes a lot of their products in the USA, that's awesome!! Those Uncle Goose blocks are awesome! 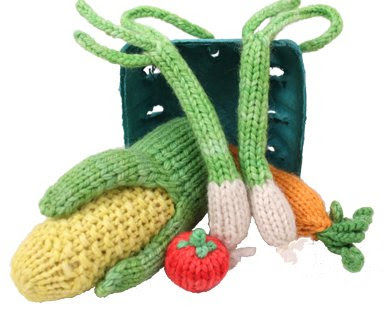 I also love the knitted play food and even more that they are all made in America! those toys are adorable alissa. i love the crochet vegetables and fruits. and again see there are toys that are made in america, buy american people, buy american! Great round-up! My son has the tug boat! I also often see Green Toys at my local TJ Maxx! Thank you Alissa for sharing this! 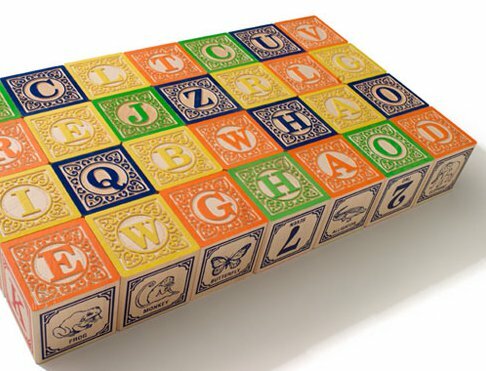 I have wanted some baby blocks for the nursery that were colorful and vibrant. It looks like the Uncle Goose shop has just what I was looking for. I love that they are American made too. Awesome post! I am glad to see that there are so many toys still made in the US! I love the green company too, we have their garbage truck toy and the boys love it. Ok. Uncle Goose owes you big time! Not only did I order the wonderful alphabet blocks, but have you seen their Elemental blocks? The Periodic Table on blocks! My son and his wife are both scientists and they went gaga for those! 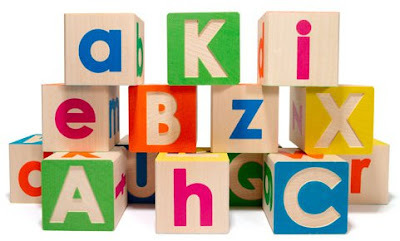 Oh, and FYI, I ordered the basic alphabet blocks with wagon via UG's site but later see they're sold on Amazon for less, plus with free shipping and tax I just contributed significantly to our Michigan economy! I paid $67.04, Amazon's price $45.95 with free shipping! Gah!